Posted in Pork, on September 19th, 2009. 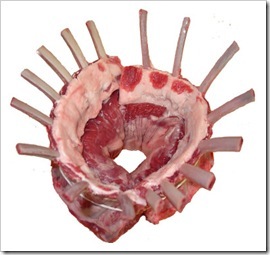 Sorry I don’t have the full-blown crown roast photograph for you. But this was from a cooking class; I was seated at the back of the classroom kitchen, and couldn’t very well make a scene by telling them to stop the production so I could take a picture! I do that enough at home, and my DH never fails to tease me in front of anyone who will listen, about how I fix this great meal and then whisk it all over to my photo area and delay the meal by a minute or so. At the pork-centered class early this week, the chef prepared a crown roast – half of it was made up of “commodity” pork (ordinary grocery store variety), and the other half was from Berkshire pigs. He wouldn’t tell us which was which. He knew, and told us eventually, but he made us raise our hands on which one we liked better. With only a show of 1 or 2 hands in the entire class for one type, you can guess that most of us could tell the difference. The Berkshire is just more tender (less chewy) and more tasty. The meat is better marbled, so it makes for a better taste. To the left is a web photo I found from Reader’s Digest. Really? Yup. Found it at rd.com. That’s a very fancy one, stuffed. Below is a photo of the raw racks. This photo I found online from Edgemont meats. As for the preparation – I won’t say this recipe is off the charts particularly, but it was good. Very good, actually. I liked the pan gravy, although I might spice it up a bit more with some herbs. But I’m going to give you the recipe as given to us in the class, flavored with shallots, apple juice and caramelized apples. This would make a beautiful Christmas dinner, I think. Or Easter, perhaps. Or any other special occasion. It does serve a lot of people – I’d think at least 10. Maybe more, depending on how meaty the pork racks are. 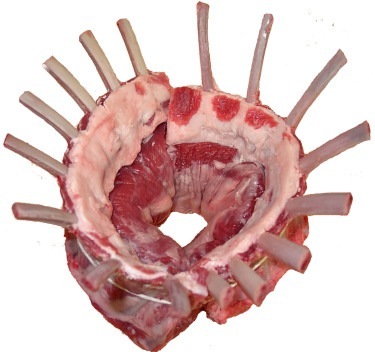 The crown roast is comprised of two full racks of rib loin chops (bone-in, standing with rib ends up). Usually they’re already prepped for you – standing up, the top ribs cleaned off (wrap them in foil, please during baking) and firmly bound in cooking twine. If you’re lucky enough to find a Berkshire crown roast of pork, by all means GO FOR IT! This recipe is a bit more work than some – there are several steps to making the pan gravy, and you’ll have more than a few dirty pots and pans. But it’s very tasty and worth the effort. 1. 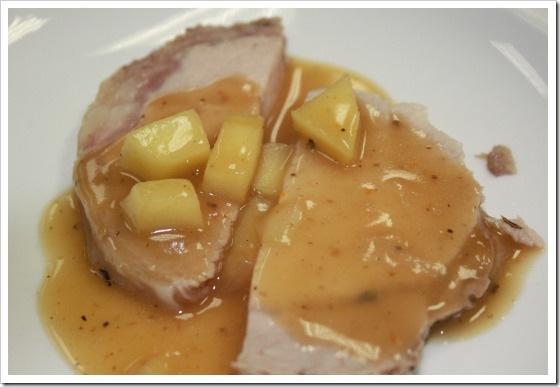 PORK ROAST: Preheat oven to 400. 2. Rub the roast with some olive oil, then season it with salt, pepper, garlic and thyme. If the roast is not already positioned as a crown roast, you’ll need to tie two racks together, carefully in a circle, and tie firmly (meat will shrink during baking) to keep it standing upright. Place in a rimmed roasting pan. Cover the exposed ribs with foil so they don’t burn. 3. Place roast in the center of the oven and roast for 20 minutes until it’s golden brown. 4. Reduce the oven temp to 350 and cook to an internal temp of 140 (about 1 1/2 hours or longer). (If the roast is stuffed, cook to an internal temp of 155.) Add the vegetables to the pan during the last 30 minutes of baking. Remove from the oven and transfer meat to a cutting board or serving platter. (Do not throw out the pan drippings.) Cover loosely with foil and allow it to rest for 20 minutes. 5. CARAMELIZED APPLES: While the roast is cooking, you can prepare the apples. In a large saute pan melt the butter and add the apple cubes. Stir and cook for about 8-10 minutes until the apples have begun to cook through. Add the sugar and continue cooking until the apples have just begun to caramelize and reach a golden brown color. It’s not necessary to cook them until they’re mush – you want them to still have some shape and texture. 6. 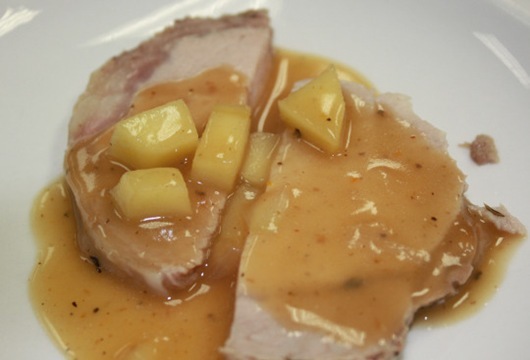 GRAVY: Pour off all but 1/2 cup of the pan drippings and add that to a large frying pan. Add the roasted vegetables too (although they are strained out later.) Sprinkle in the flour (to form a roux) and cook over medium heat for about 2 minutes until the mixture has thickened and bubbles. Add the chicken stock and apple juice to the pan and whisk to incorporate the roux. Allow the gravy to simmer for about 10-15 minutes. Strain the pan gravy through a sieve (to remove the vegetables and any lumps). To that same pan add the sugar. Allow it to caramelize, then add the vinegar. Simmer for a few minutes to dissolve the sugar, then add the strained pan gravy to it. Simmer it for 5-10 minutes, then add the apples and shallots. Serve hot. Per Serving: 907 Calories; 50g Fat (50.2% calories from fat); 71g Protein; 40g Carbohydrate; 3g Dietary Fiber; 231mg Cholesterol; 523mg Sodium. I’m going to try to make this for Christmas. I have been looking for a recipe like this!